...WWWWRRRRRIIIEEE...the sound was familiar as a can or a scrap signal or the rusty old iorn globbs we often encounter.but not this time!! !i dug for at least 1 1/2 foot to find the darndest object...A bugle in half cooked and crooked condition.. the markings indicat the bugle was for the early armed corps of the first war (WW1)and the name inscribed was -bugle corp-1914-army-OK i found a bugle..not bad...next signal wwwrrrriiieee ..stronger than the bugle and half as deep-a 3 minute dig revealed a medallion of the same era-1915 band corp. made of brass and heavey..so wheres the find? wwwrrrrieee...this was directly under the feet of my pal-chuck mason of glendale...Whats the hurry he says..."Well move sonny..it turned out to be a gold ring from some kind of fraternal order of the past-at least i found a worthy object and protested the fact i started on the wrong end of the park to begin with!! !the only reson i came to this park was my good friend lucky-chucky found over 300 coins and stated he had "Hunted -out" the park-.."you need a new detector chuck!! !Mine goes 4-feet-and yours only scours 8-inches or so! !>>" well sir..says he.." I will invest in a powersnoop 3000 when i hit the Jackpot!!HA! !a powersnoop 3000? try mine..HERE!he went south on me for 30 minutes and returned with two rings-7 quarters 18 dimes and 24 pennies...well chuck ? 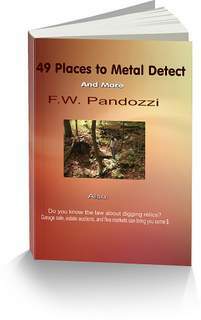 im wrong dale he said..."i will buy a whites detector friday and really find some STUFF! !so, the hunted out parks and areas are NOT hunted yet and the best treasure is still UNDERFOOT for anybody to find! !happy hunting Pluggers!!!wwwweeeerrriieee!!!? CHECK! Dale, GREAT story, thanks. You are correct about parks not being hunted out. Although I no longer hunt parks, I know many others who detect them over and over, and still find many coins, and other items.